With Glittering Eyes: "A Chance to Die"
I'm currently reading an incredibly inspiring book called "A Chance to Die. 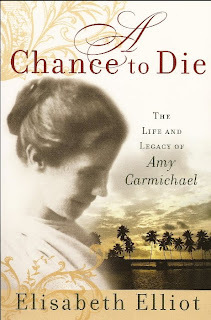 The Life and Legacy of Amy Carmichael" - written by Elisabeth Elliott. Amy Carmichael was a woman who loved Jesus and devoted her life as a missionary in Japan, China, and finally in India during the turn of the last century. She spread the gospel to people who had never heard the name of Christ. She did it passionately. Humbly. Reverently. She started a community in India for "Temple children". Children who were sold to the Hindu temples and used in whatever horrific way temple leaders wanted. They were never allowed to leave. Amy set out to save as many as she could, and along the way gave a home and love to hundreds of children. She also set out to change the face of Christianity in India. She was exhausted and discouraged by "nominal" Christians whose lives were far from a reflection of Christ's own life and love. It has immensely humbled me. It has encouraged me to love others better. It has inspired me to pour out my life and to not count the cost (or look for any praise). It has spurred me on towards Christ like few things ever have. and I am so excited to share about the things I'm learning. I love the books that you recommend, so I'm definitely going to read this one too!